We just got home from our friends' house where we had a great dinner of chicken and broccoli. What an easy, awesome, all-three-kid-loved dinner!! Thank you Heidi!! 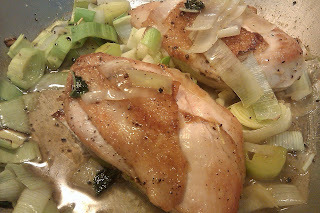 I realized on our way home, though, that I have yet to share my method of cooking up a chicken breast that is easy, efficient, and T.A.S.T.Y!! It's a definite weeknight/people coming over recipe that I call on a lot. 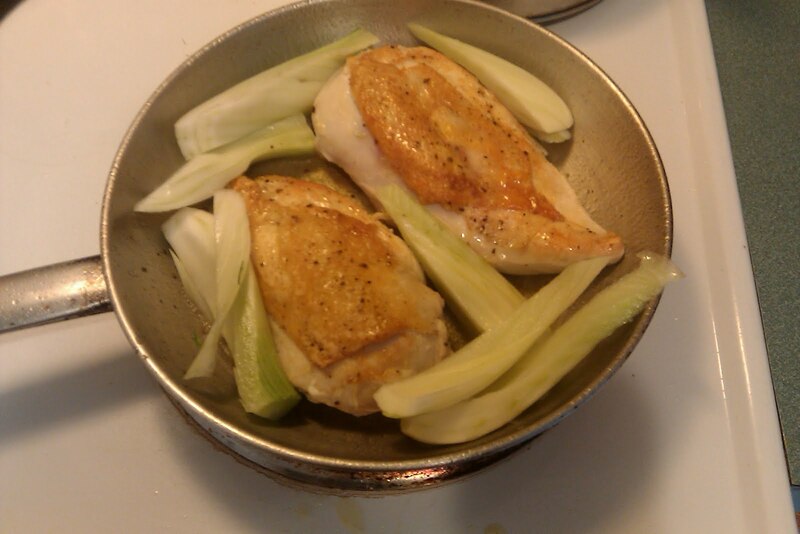 - When your pan is good and hot, gently place the chicken skin-side down in the oil and immediately give the pan a good shake to make certain that the skin doesn't stick. Let the meat cook for about 5-8 minutes then flip to show the skin-side up. Shake the pan again to ensure that the meat doesn't stick either. - At this point, the skin should be a nice golden color and look as though it's beginning to crisp. - At 10 minutes, pull out the pan to baste the chicken with the juices that have accumulated in the bottom of the pan. This will ensure that the flavors of the herbs are getting onto the meat and it will keep everything nice and tender. - Set the timer for another 5 minutes. - When that sucker goes off it's (probably****) time to take the chicken out of the oven. Let the meat stand for 5 minutes or so before you serve it to be certain that the juices have stopped flowing and will stay in the meat as opposed to flowing out in a gush when out cut into it. Serve with steamed broccoli, baked potato, rice, you name it! Read the following asterisks. There's some good stuff there!! *I used to buy chicken breasts that had been boned and skinned with the impression that they were better for me. I've learned, though, that roasting chicken with the skin on helps keep in the juices, you get tons of flavor, and if you don't eat it, there is little to no added fat. 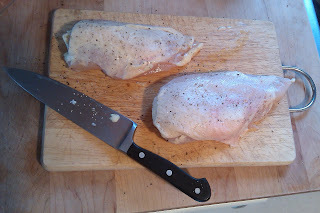 Also, if you buy the breasts bone-in, it's a) cheaper and b) you can throw the bones in the freezer for making stock another day, making it an even better bargain because you're creating two if not three to four more uses out of the one purchase. AWESOME!! ** If you have to turn your back to save a small child from choking on something and turn around to see the pan smoking, don't worry. Let it cool off and continue. 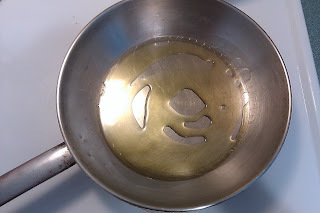 If the oil is black or noticeably different looking, just start over. No worries. By the way, it goes without saying that it's best NOT to turn your back on a pan of hot oil on the stove... just sayin'. We may be busy, but safety is much more important. 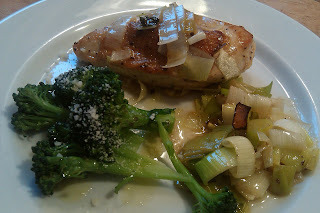 *** This is also the time when I have added sliced fennel bulb, fresh garlic sprouts, sliced leeks, anything that might roast in 10-15 minutes. This is a great way to easily cook up some veggies. ****I have a meat thermometer in my kitchen. From time to time, when I have a big chicken breast that I'm not sure is done cooking by sight or touch, I'll check the temp (read the instructions for proper use) to see where I stand. It's good to know that when meat comes out of the oven the temperature will keep rising for at least a couple of minutes. Standard safety temps say that poultry need to be at 165º to be safe, but that doesn't mean straight out of the oven. If you let that bird cook until it measures 165º out of the gate, it is going to be dry, dry, dry, dry!! If you must check the temp for your own personal comfort, pull it out at around 155º or so. Let it stand for 5-10 minutes and check it again. As long as it reaches and rests at 165º, you'll be just fine.